Thanksgiving for those of us in the US is quickly approaching. We just had our election and now we are moving on to preparing our menus, ordering our turkeys, and inviting family and friends. I have made small and large turkeys. Had a few friends and tons of family. Every year we have our favorites and the oldie but goodies on our tables. Through the years our recipes have changed just a bit. Take the mashed potatoes as an example. For the greater part of my child and adult life they have been made with basic ingredients: potatoes, milk and butter with a lot of salt added. My sister in law, Amy, introduced us to a new way of adding a bit more flavor to this already traditional dish. Honestly, we never looked back. It was a hit and I can't imagine not making them this way. Below you will find the three recipes that we enjoy this time of year. They are not hard, in fact, very easy but the flavors are traditional for this time of year. Drain potatoes in strainer. In the hot pot, add butter and bullion. Stir to combine until bullion is dissolved. Add boiled potatoes and evaporated milk. Using a potato masher or electric mixer, blend potatoes until smooth. 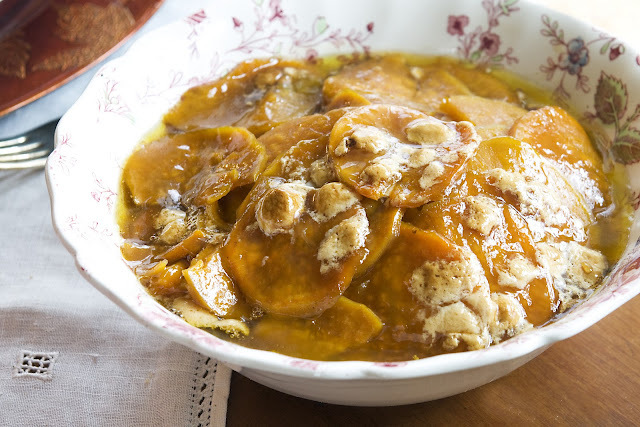 In a glass pie plate, layer the sliced sweet potatoes. In between each layer, grate butter (this is a quick method to use) and sprinkle with brown sugar. On last layer, add butter, brown sugar and salt. Bake for 30 minutes or until sweet potatoes are soft. Add marshmallows and cook for 5 minutes until soft. I transfer to a prettier bowl to serve. *I like to overcook my marshmallows until they are very brown and almost melted. This adds a nice flavor to the dish. 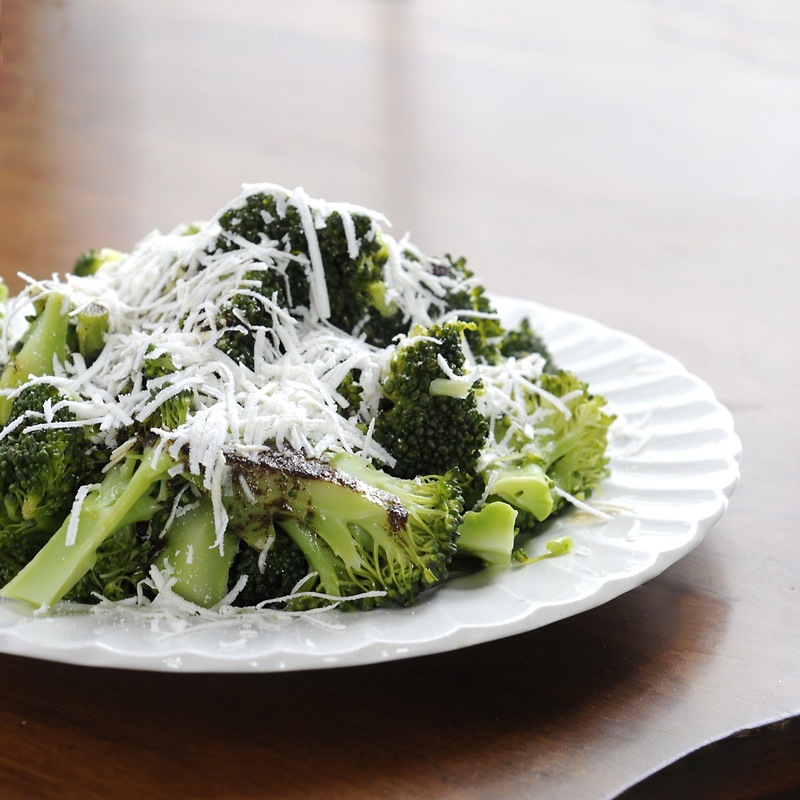 Steam broccoli until desired tenderness. Do not boil, it will make the broccoli too watery and dilute the brown butter. In a sauté pan, brown butter. To brown butter: cook butter over medium heat until the color slowly changes to a caramel color. Be careful to not burn. It will have a nice nutty aroma. In a bowl, add steamed broccoli and drizzle with brown butter. Sprinkle cheese on top. Mizithra Cheese can be purchased at most specialty grocery stores or in the cheese department. It has a specific texture and flavor and cannot be easily replaced with something else. It also works great over a bowl of pasta with browned butter and this cheese. Um yes. 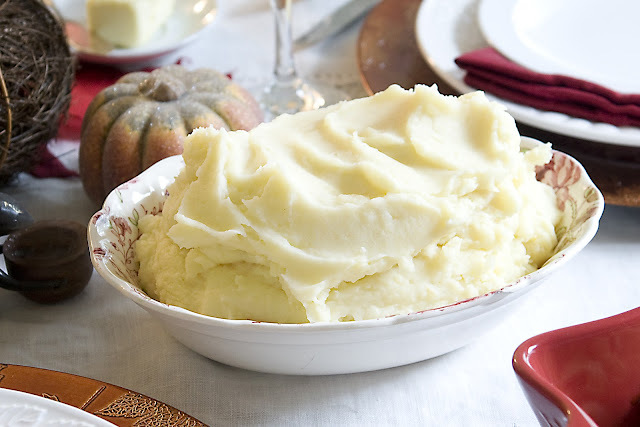 I will take that entire dish of mashed potatoes. I'll just be sitting in the corner shoveling it into my mouth, mmk?